STEPMOM FILES FOR ARREST OF STEPSON'S PARROT - Onome Talk Am! She says” “I am being harassed for the last two years. On seeing me, the parrot uses bad language and foul words. That is why I have complained thrice in the last two years. 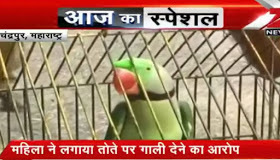 Police called me,Suresh and the parrot to the police station. Police should investigate and seize the parrot,”said Janabai. The parrot, named Hariyal, is owned by Janabai’s stepson Suresh. A complaint was also registered against him. Both live separately due to a propert dispute. No charges were pressed against Hariyal. However, he was handed over to the forestry department of the state. This not the first time birds have been criminally investigated in India, earlier a pigeon was detained over suspicion of carrying out spy activities for Pakistan. Lol…..like we say in Nigeria,orisirisi, how she take hear wetin parrot talk?poor parrot.